CreationS - The Essene of Arts: Give-away on the arrival of my lil princess "Aadhya"
Give-away on the arrival of my lil princess "Aadhya"
Such a long time..!! But my days are moving like seconds..
It’s Party time. I am enjoying a new phase of life – Motherhood. My cute little princess "Aadhya " is one month old now!! One month!! Ahh, days passed like seconds.. Kids are little miracle, bunch of Joy. Life is so amazing with them. I mean yes - in all aspects,including my favorite line "I am exhausted!! For the great celebration, I am announcing an exiting Give-away..!!! ★ Comment on this post. and become a follower of my blog (on the sidebar) and leave me a comment. ★ Like my Facebook page. ★ If you are a non blogger, please leave me your email address in your comment… I’d love for you to participate as well. ★ If my work inspired you to create something, leave me a comment and send me an e-mail of your work. So where ever you are, comment away and like my page and you are all set!!!! Congratulations on your new bundle of joy dear..I completely agree with you, motherhood is so fulfilling and amazing, me too having a lovely time with my 1 year old. I am old follower of yours and love your creations.. Enjoy your time with the little one. hi Rachana... Heartly congratulations on new arrival....:)) I can understand your feelings very well as m also a mother of 3 years old boy (Aachman), n an artist too.I love your artwork n style too as its very bright n colorful .Use of vibrant colors uplift my soul always .so keep up gud work always n njoy ur motherhood.Hugs!!!! chooo chweeet .congrats rachana.i'm just imagining the pretty eyes with lots of pride holding apple of your eye.God bless sweety and her parents.convey this aunt's luv and kisses to her :).my prayers always. Aadhya is so gorgeous , Rachana...all my love and wishes for her forever. 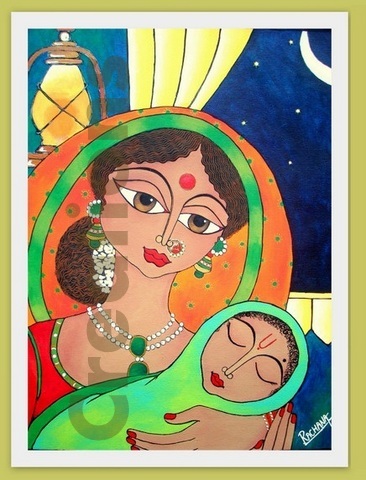 As far as the painting on motherhood ...its beautiful and rightly portrays every mom...i have always enjoyed your art ..keep up and longing to see more..
Congratulations to the Proud Parents !!! Heartiest Congratulations on the arrival of your precious one!!! And you are right, all aspects of Motherhood are to be enjoyed and cherished. And thank you for participating in the give-away!! Dear Rachna ... I am a new follower ... just chanced by your art blog and very happy to have :) I am very impressed and inspired by your works of art, especially your attention to little details. Hearty congratulations on your motherhood! Aadhya is as beautiful as her name - so unique! She looks so ... mmm... musical :) And I must add, she is, and will remain, your finest creation ever! :) :) Happy times! She looks adorable in this picture! You must be so proud. Are you getting any sleep? I hope you rest while she naps and enjoy every minute while she is awake. Congratulations to you and your family on the arrival of an angel!